As an ‘R’ rated judge, one of Hope Glynn’s pet peeves is witnessing riders who don’t use the corners on course to their full advantage. Setting up the proper track at the proper pace out of the turn is crucial to the subsequent outcome of that first fence or a line. Learn her strategies to consistently set yourself and your horse up for success coming out of a turn. Equine activities can be hazardous and may subject participants to injury. 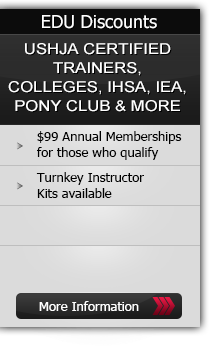 Neither Equestrian Coach, LLC nor Hope & Ned Glynn assume liability for your activities. This program provides general instructions and techniques that may not be suitable for everyone. No warranty is given regarding suitability of these instructions to the viewer.